We’ve had our D’oh moments on the trip, but fortunately none of them were at Homer. 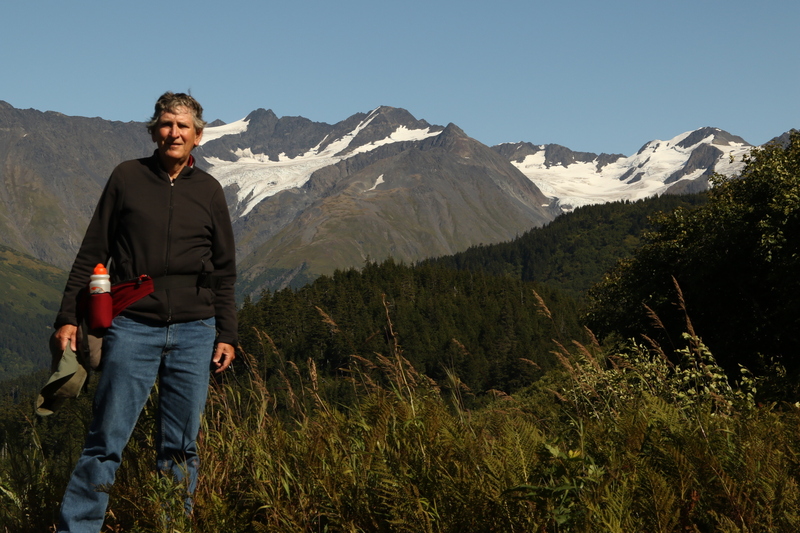 The route from Seward to Homer was a good sampler of coastal Alaskan geography. Coming out of town we drove through glacier-topped, black stone mountains. When we turned onto the Sterling Highway, we passed through mountains that grew from evergreen-clad bottoms to treeless brown tops, I assume some kind of tundra. At ground level, we were surrounded by lakes and rivers, especially the Kenai and Russian, crawling with fishermen. 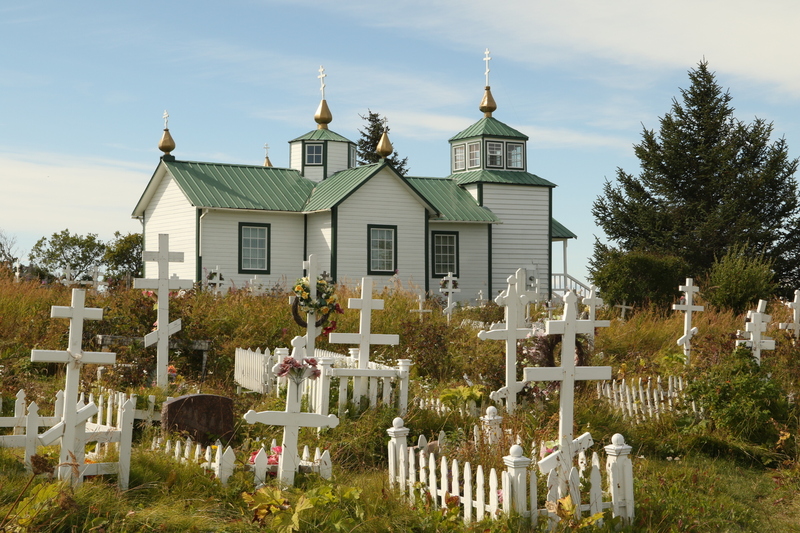 Russian Orthodox church in Ninilchik. After a stretch of scraggily low country, we reached Cook Inlet. 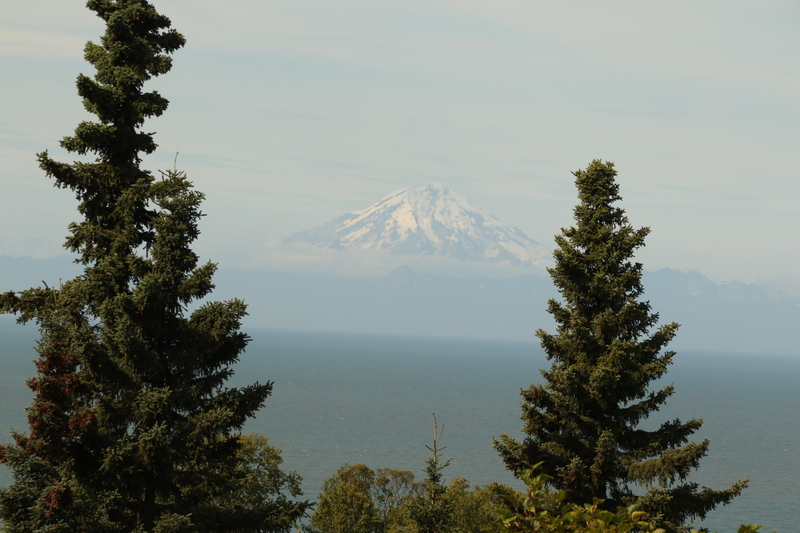 Across the water, about 50 miles away, rose Mount Redoubt, at over 10,000 the tallest volcano in the Aleutian range. Active volcano. It’s erupted in the last ten years. A few miles after driving through Anchor Point, the farthest west you can drive in the United States without doing some serious portaging, we arrived at Homer, where we camped in the Driftwood Campground, probably the smallest campground we’ve experienced so far. 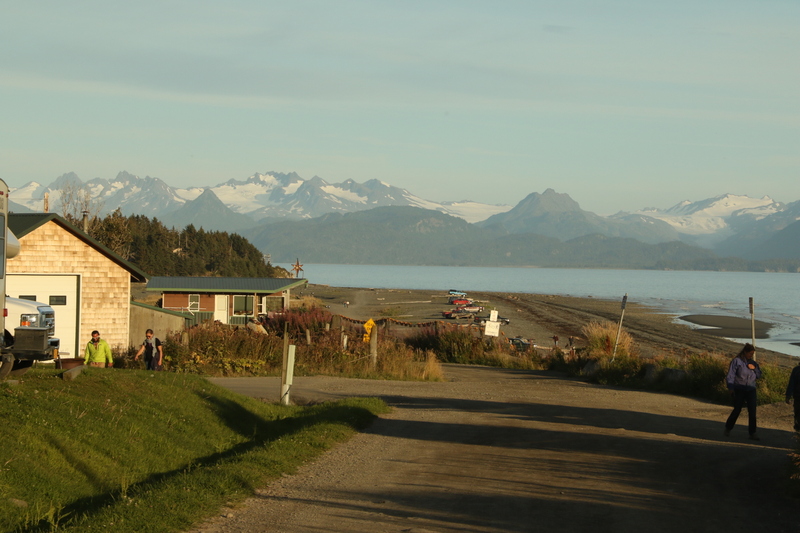 There weren’t more than a dozen campers parked on the site, which sits on a bluff just set back from the water’s edge, at the mouth of Kachemak Bay where it connects with what looks like the ocean. 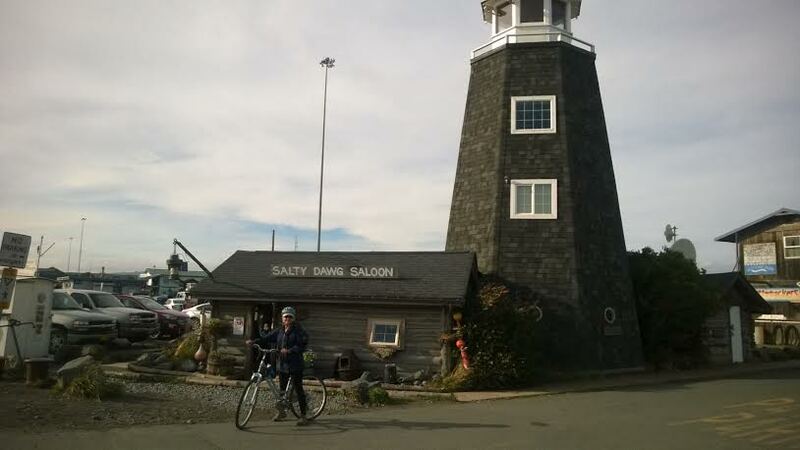 The town is a little different from others we’ve visited in Alaska. It’s much more spread out. The shops are a little higher end. 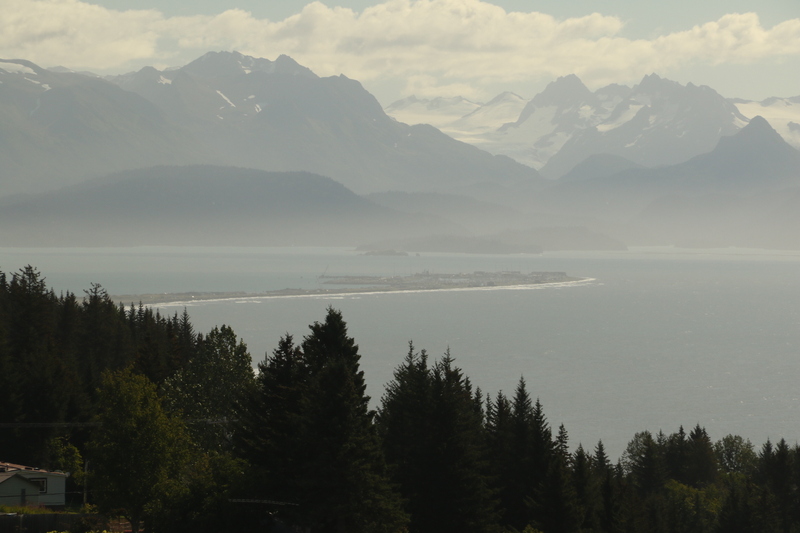 Then there’s the Homer Spit, a little appendix-like projection that sticks out into the Bay toward the mountains and glaciers of the Kenai. We biked to the spit. It was a good, long ride, mostly on level ground, but the wind was really howling. And in our face coming back. The spit is almost a causeway with campgrounds, a few restaurants, and a lot of fishing tour headquarters. We heard, and saw, several pairs of sandhill cranes. While we were on the spit, we saw a few wind surfers (one hopes they had thermal wet suits), and one wind surfer on an over-sized skateboard who passed us on the bikeway. 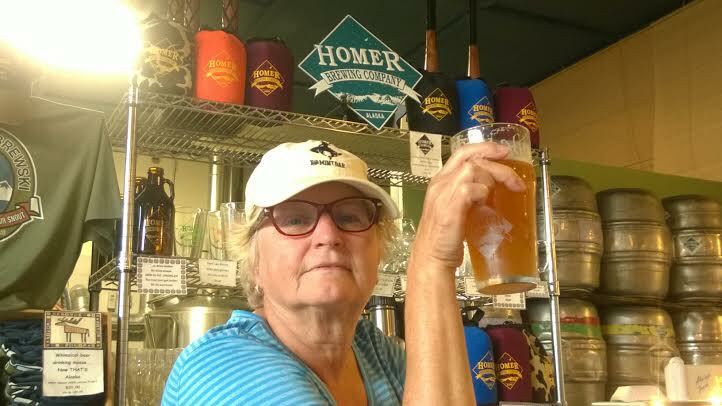 We did find the local brewery, Homer Brewing Company, where I had an ESB that wasn’t particularly bitter; they didn’t have an IPA on tap. Two Sisters bakery makes great bread and desserts, and the best sticky nuns you could wish for for breakfast. After two nights we headed back toward the “mainland,” where we hit some serious winds when we got back to the Turnagain Arm. 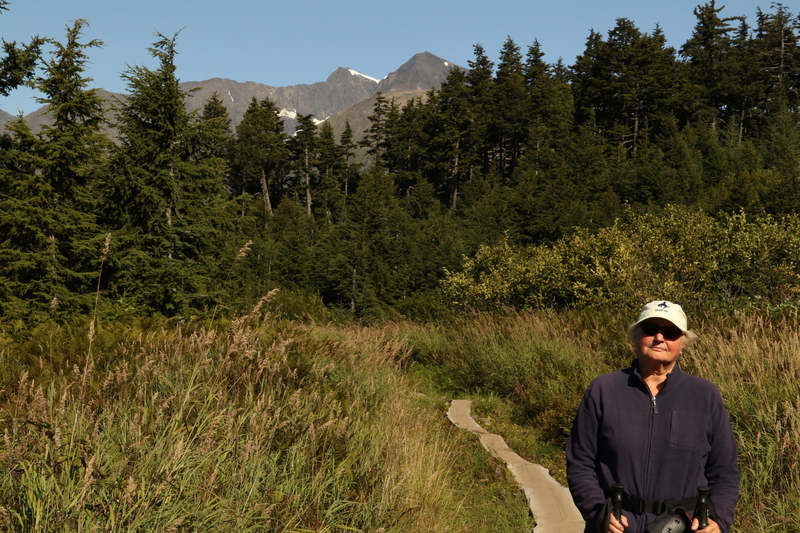 Before we got back to Anchorage, we turned east for a couple of blocks and stopped at Girdwood, where we decided to spend a couple of nights in a condo. 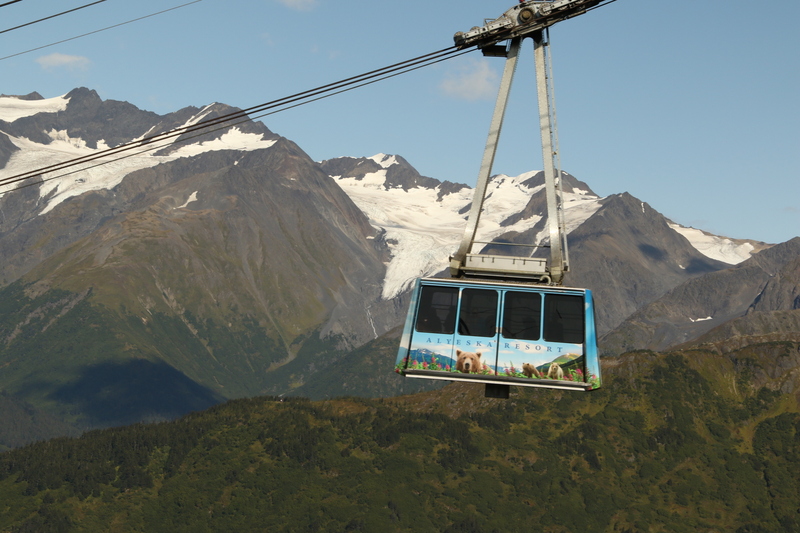 Girdwood is a ski resort for Anchorage. 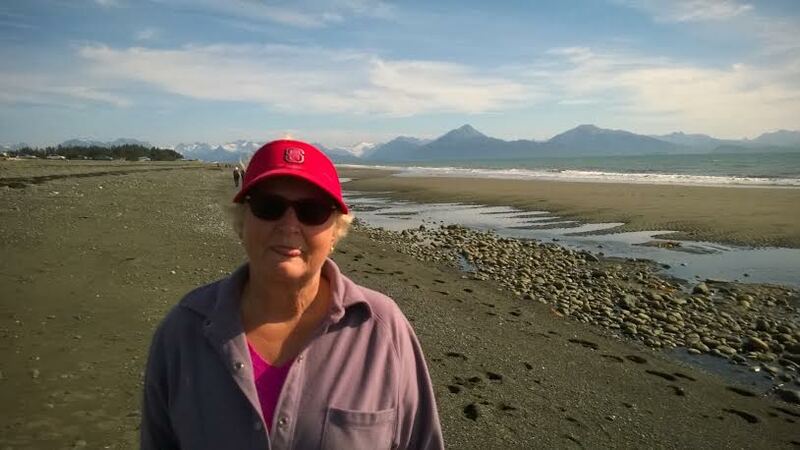 The setting is beautiful, with the Turnagain Arm on the west, mountains and glaciers in the other three directions, and ski mountain Mount Alyeska rising up above the small town. There’s no skiing right now. This morning we rode our bikes down to the Arm, then this afternoon we went over to the ski resort and hiked up the mountain. Ho, hum, another mountain climbed, 2000 feet ascent in 2.2 miles. It was a great trail, with appropriate switchbacks and, where the trail was steep, steps cut into the rocks. The reward for the hike was a free ride back down on the tram. Tomorrow we start edging toward Denali, where right now the weather is turning cold and snowy. Hey, Trintech, name that lighthouse.